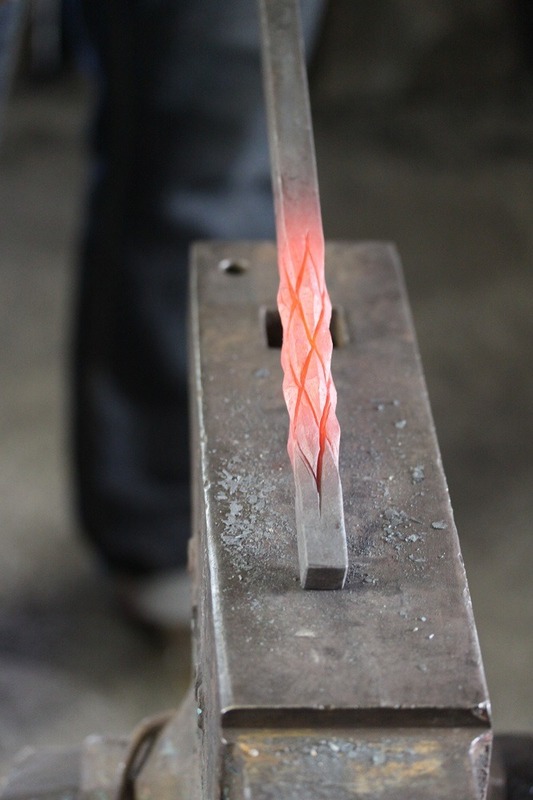 Course summary: Learn to forge an organic leaf twist or the very cool ‘cube’ or ‘pine apple’ twists – and use it in the forging of a poker, rake or shovel. A great introduction to the craft of the blacksmith. 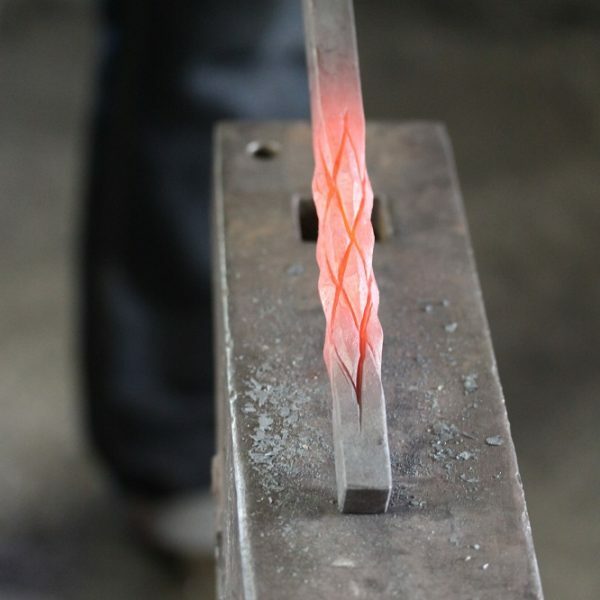 Blacksmithing techniques: drawing out (forging tapers), twisting, use of swage tools, setting in, chiselling, sheet work, riveting, use of a traditional blacksmiths coke hearth. For those who have done a course previously you are welcome to make a pair of blacksmiths tongs – but do let me know when you book. This is a one-day course in practical hands-on blacksmithing. 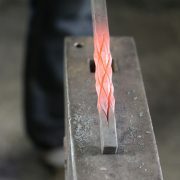 The aim of the course is to forge some fire-side tools – in order to learn some blacksmiths techniques. For beginners the options are to make a leaf poker or shovel. 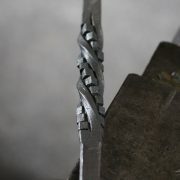 Or you can choose to make a finial using various twists. Try out the pineapple-twist or the cube-twist. 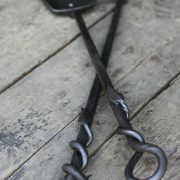 If you have already done some blacksmithing, you can also make a pair of blacksmiths tongs. This is a great exercise which involves hot punching and hot riveting. 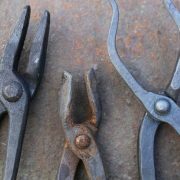 After completing this course you will be able to make more tongs at home, as well as know how to fix an old pair of blacksmiths tongs. Arrival is at 10am, where Gunvor the tutor will introduce the forge. The participant’s individual work spaces as well as health & safety is covered. The correct use of the coke hearths involves how to maintain the fire. How to achieve the correct heat in the right place. The minimum and maximum heat ranges and their corresponding colors. To give you some insight into the working day of a full-time blacksmith Gunvor will usually fill you in as to what’s currently on at the forge. If you are interested in full-time education in the craft, you will get a chance to ask the tutor about this. After the introduction it time to get hands on. The approach is simple. Demos mixed with as much time at the anvil as possible. To get a feel for this craft you have to just give it a go, so Gunvor likes to give the participants a chance to make their own decisions, make a few mistakes etc. There is always more than one way to achieve the same thing. 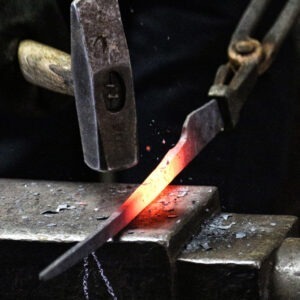 Although there is supposed to be just seven basic techniques of the blacksmith, it is very much a craft that relies on a person’s intuition and common sense. So the variation and combination of techniques is endless, which is why this craft keeps being fun. Knowledge is important – but anvil time is what you need the most. Keep practicing! Beware you might get hooked! 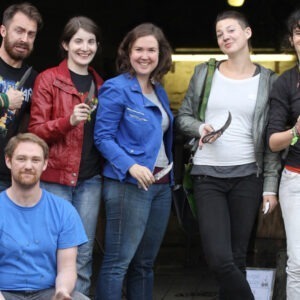 If you have already done this course, consider signing up for blade smithing or axe making. 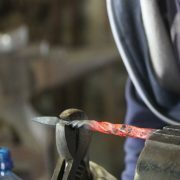 You can also become a member of the Irish Artist Blacksmith Association and participate in forge-ins. It’s a great way to meet like minded people and pick up some new skills. Having just done the fireside tool course I have to say I really love it and I had fantastic day making a pair of blacksmith tongs. A great day and a great course and I would highly RECOMMEND it to anyone. Gunvor is fantastic and has such a great KNOWLEDGE of blacksmithing and she brings a great FRIENDLY atmosphere in the forge. She also has great PATIENCE and even though I messed up one side of my tongs she was there to support me and I was able to restart the half that I destroyed and knock out an even better piece. What a fantastic day we had yesterday – came home with a wonderful ornate fireside poker and holder which I made myself!!! First time ever doing blacksmithing and it was great fun. Great camaraderie – I literally forgot about everything for the whole day as I worked on shaping my iron bars into objects of beauty. I had never met Gunvor before yesterday but I can highly recommend her and her courses. . I think she must be some kind of saint! (Thanks Gunvor – your great patience, happy disposition, and wonderful teaching created just the perfect atmosphere for us to learn and enjoy our course – and everyone came home with something we could feel proud of. I will be back!) Thanks again. Fantastic feedback Brian, thank you!! First things first, I am not in the HABIT of leaving reviews online. But this is a special one. Meeting a master in their own trade is always interesting. Having hands on experience with one is fascinating. Not only does Gunvor understand the subtleties of her craft to the highest degree, she also teaches with the precise balance of guidance and freedom to explore different routes. 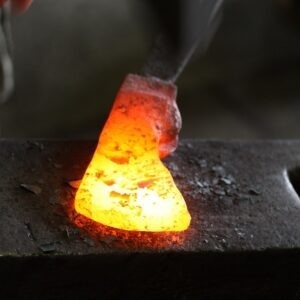 I had the tiniest bit of experience in blacksmithing (mostly theoretical), and Gunvor adapted the course by asking me what I wanted to achieve and what I wanted to gain from those few hours. We were supposed to make fire side tools, I came home with two pairs of blacksmithing tongs, an unforgettable lesson, and the joy of crafting something of which I can proudly say “I made that”. Truly inspiring, I would highly recommend this course to first timers as well as beginners wanting to develop some skills under the expert eyes of a great teacher. This was a wonderful day of learning, fun, and whacking hot steel with a hammer. Would do it again in a heartbeat.